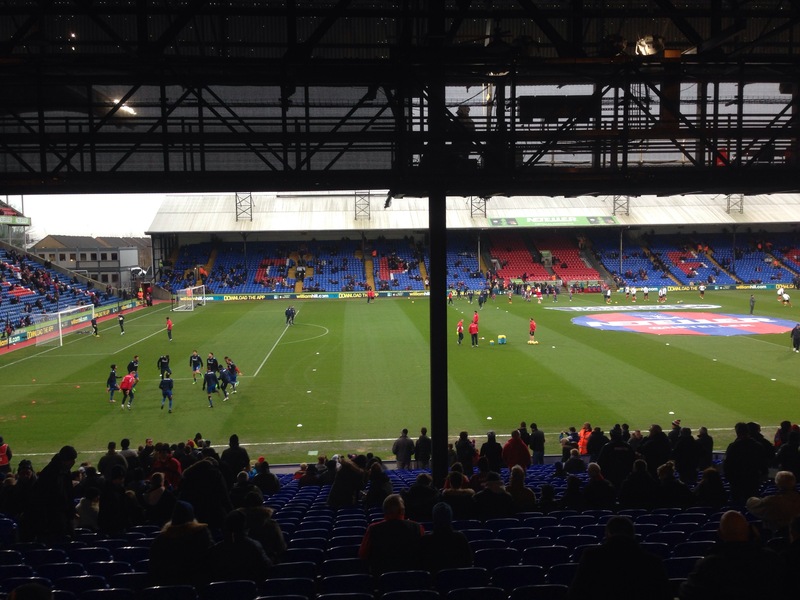 Being back in the UK over Christmas also meant that I could head back to Selhurst Park to take in the fantastic EPL action available at Crystal Palace. Before I went to university, my dad and I used to have season tickets at Palace, and for the majority of the time that meant enduring watching turgid dross as Palace regularly fought (and escaped) relegation fights at the bottom of Division 1. Particular favourites included losing at home to Grimsby and the foggy night we were 3-1 down to Crewe, when after an hour the crowd started willing the fog to thicken so the match would have to be abandoned. This season, we are fighting relegation from the Premier League instead, and rather than the northern giants we welcomed Southampton to Selhurst on Boxing Day. Although it was a different league, we put in a similar performance to days of yore and were 3-0 down soon after half time. Although we pulled one back later in the second half through Scott Dann, the disappointing display was enough to result in the sacking of manager Neil Warnock the following morning. A couple of days later, I headed to Alexandra Palace for the darts. 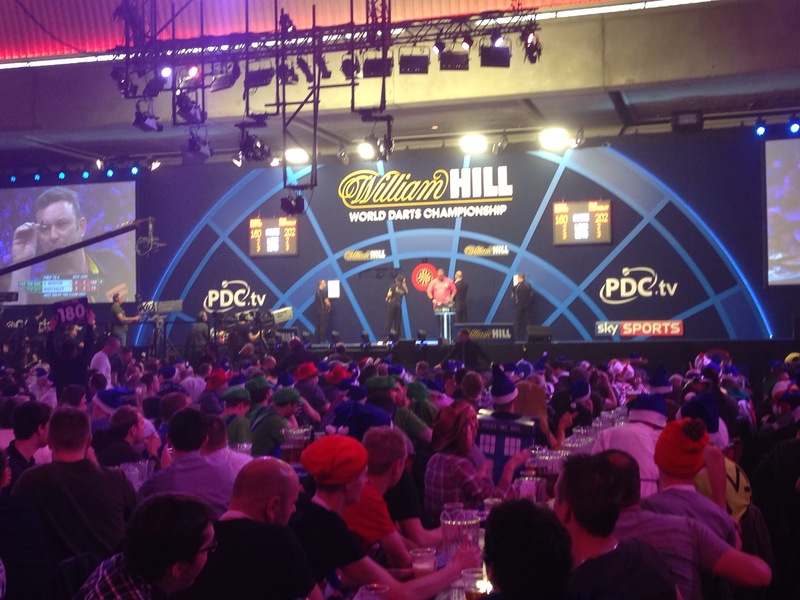 Fast becoming more mainstream in the UK, a night at the darts is one of the best nights out you’ll have. This year was fourth or fifth time I’ve been, but my first time seeing the greatest player who ever lived Phil Taylor. When you buy tickets back in June, you obviously have no idea who you’ll actually see on the night; in previous years, I’ve experienced previous world champions such as Barney, Part and Priestley and this year on the night we went we got to see the 16-time champ Taylor and 2-time champ Adrian Lewis, so were pretty lucky in that respect! A lot of the night is about the drinking, and it’s not uncommon for people to buy pitchers of beer rather than pints. 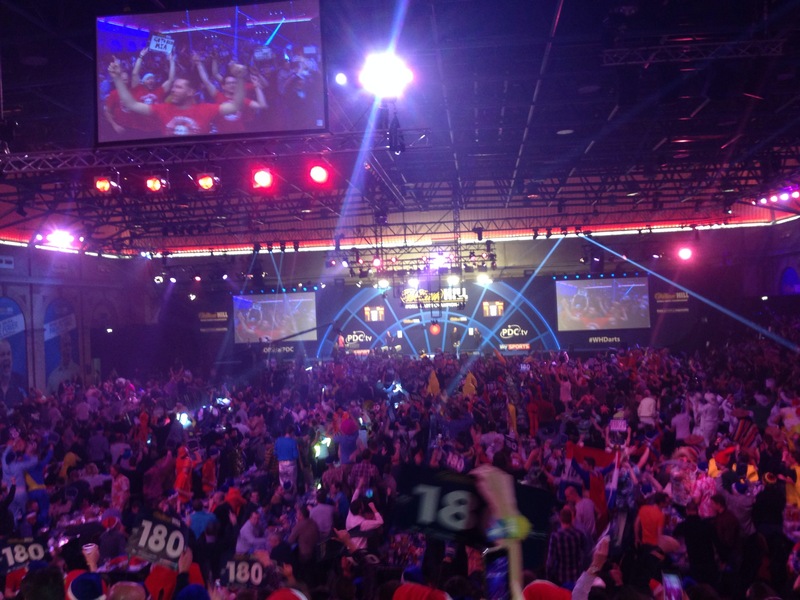 After a while, it becomes hard to even make out the players on the stage let alone the darts they’re throwing! The atmosphere in the crowd is what makes the evening, with everyone contributing and waiting for the elusive 9 dart perfect finish, or more common the classic 180 shot. Will definitely be back next time I’m home! We are back in the game. The second half of last year was horrendously busy with work and study commitments which led both to having no time to write about anything, and more importantly no time to actually do anything to write about! As such, this blog had its first hiatus for about three years; however, after a couple of months without any updates, I’m finally back at the keyboard. This Christmas saw me back in the UK for a couple of weeks to catch up with friends and family and generally chill after the hectic end of last year. Although it was good to be back, the time always passes so quickly and it seems that before you know it you’re back at Heathrow again looking forward to yet another 12 hour flight. 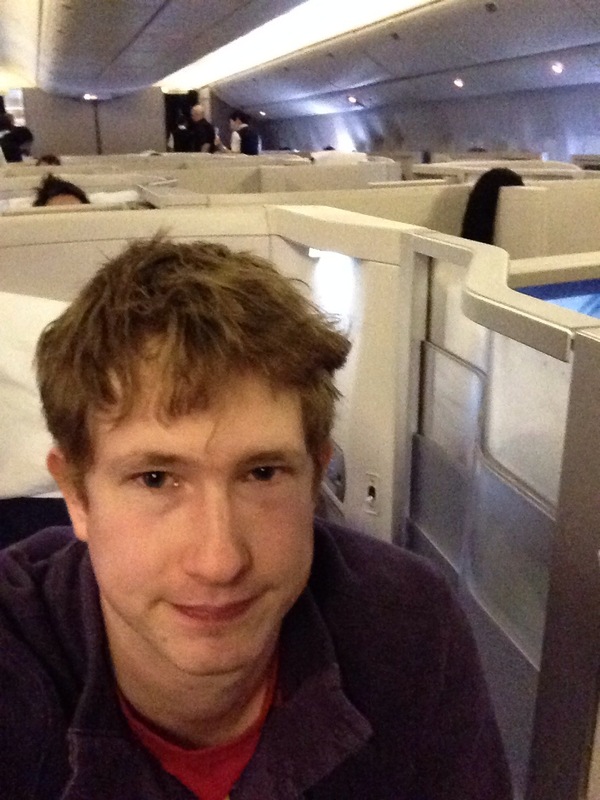 My journey home from Tokyo before Christmas though was worth mentioning – I had an unplanned upgrade to Business class! Just before check-in at Narita, I was talking with Helen about how neither of us had ever flown above economy, and that people get upgraded in films and on TV all the time but that it never happens in real life. Fast forward five minutes and the very same situation unfolded in front of me. I was told on dropping off my bag that there was some good news, and that the flight was fully booked. That immediately raised alarm bells, as it didn’t particularly sound promising. 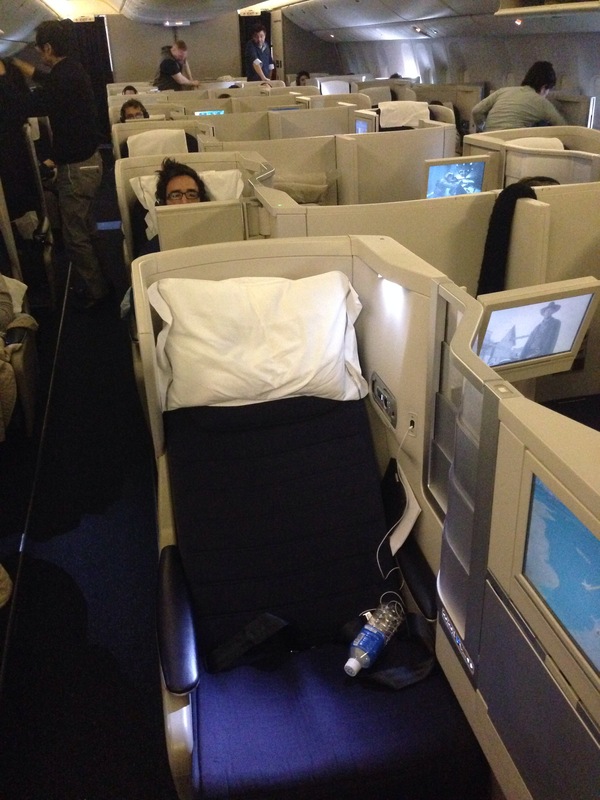 As the flight was fully booked, I’d apparently been upgraded for free to Business class. Not quite believing my ears, and in a state of semi-shock, I asked the assistant “Really?” before she confirmed it again. Score! Helen, unfortunately, wasn’t coming back to the UK but instead jetting off to visit her sister in New Zealand, so I had the delights of the jet set lifestyle all to myself. Having checked in, I spent a little time trying to see whether there was a lounge I was entitled to enter before take off, but I couldn’t find one. I settled for waiting with the rest of the plebs in the normal seats, before entering the plane first with a smug look of content on my face. A brief moment of doubt flashed across my mind when they scanned my boarding pass, but it beeped through all clear so I didn’t have to face the humiliation of being turned away in my moment of glory. On taking my seat, I familiarised myself with the cabin, reading the notes of how to lower the seat to turn it into a bed later in the journey. I was interrupted when I was offered a choice of water, orange juice or champagne to help me board satisfactorily. I ultimately boarded very satisfactorily. 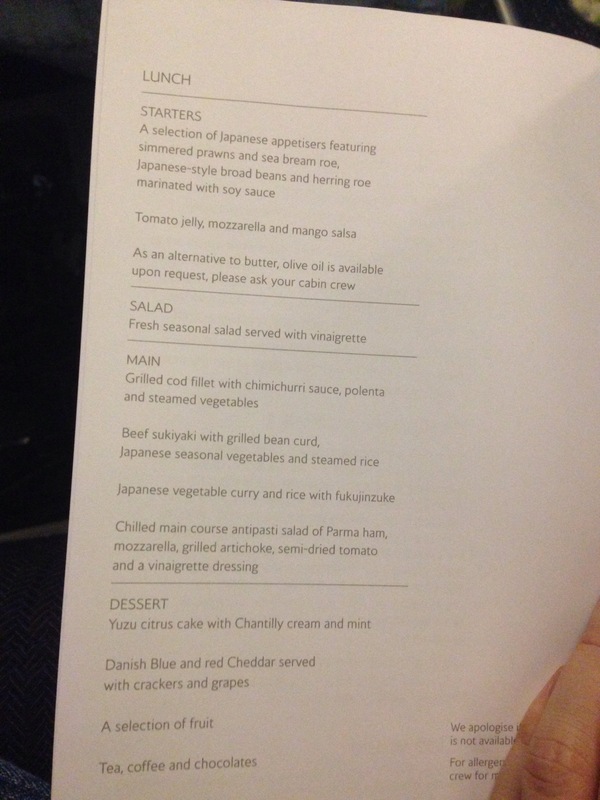 I perused the menu, and didn’t understand half of it. Oh how the other half live! When the food came it arrived on an actual plate with actual real knives and forks, unlike the plastic the hoi polloi have to contend with. Indeed, having taken the plate away and just as I was settling in to watch some TV again, I was interrupted once more with “And now your main course, sir”. 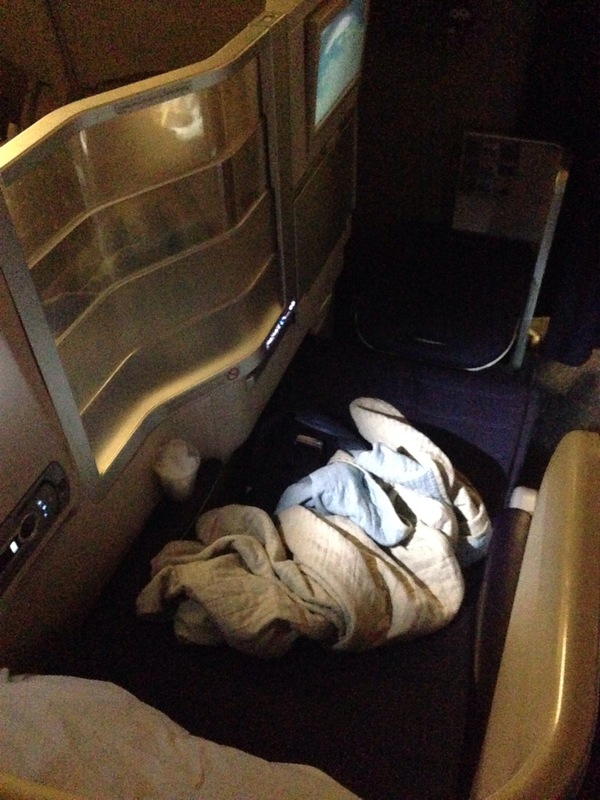 I spent 12 glorious hours truly in the lap of luxury. Having a flat bed, I could actually sleep properly for probably the first time on a plane, rather than having my gangly legs squeezed into or under the chair in front. Having unlimited free drinks and snacks was also rather nice. Given the rare, and probably only once-in-a-lifetime opportunity of experiencing the life of the well-to-do I took full advantage. I barely thought about it at all on the return journey when I was back with the plebs.